When ordering your personalised playing cards, did you think about the tuck box? Often overlooked this is the first thing your friends/colleagues will see before the cards themselves. Make the most of your design and layout by adding photos and logos to the box as well as text. There is no additional cost for designing the box to the max and using multiple colours. 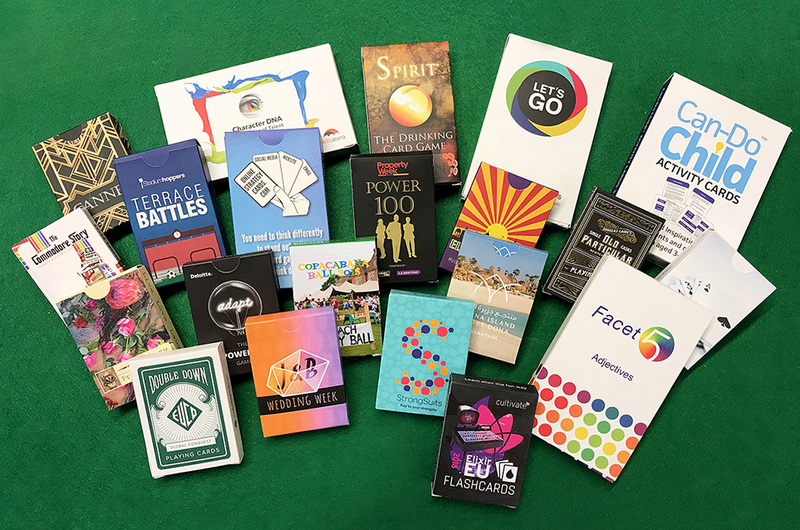 If you are exhibiting and using the personalised playing cards as freebies/giveaways, this will help attract more visitors to your stand and interact with you and your staff. All our boxes are printed on high grade 350gsm silk board with a matt laminate finish as standard. If preferred we can use a gloss laminate instead. To protect the boxes further we can shrink wrap the finished personalised playing cards in plastic which shows the cards have never been used or opened. It doesn’t cost a great deal and adds that extra professional finish to your product.